Human Chondrocytes Osteoarthritis (HC-OA) are derived from human articular cartilage of donors with OA. Osteoarthritis is an inflammatory disease characterized by increased degradation of cartilage tissue in the joint due to overproduction of enzymes degrading the extracellular matrix. Despite the initial proliferation and activation of chondrocytes, they are not able to efficiently repair the degrading cartilage. Instead, chondrocytes undergo terminal differentiation and eventually apoptose, leading to mineralization of cartilage in a process resembling bone formation during development. Thus, HC-OA provide a useful model to study changes in chondrocyte biology in response to abnormal environment of the OA joint. HC-OA from Cell Applications, Inc. have been used to demonstrate that THF-alpha activates transcription of ADAMTS-4, a metalloproteinase implicated in cartilage degradation in OA, via p38-MAPK-dependent mechanism. 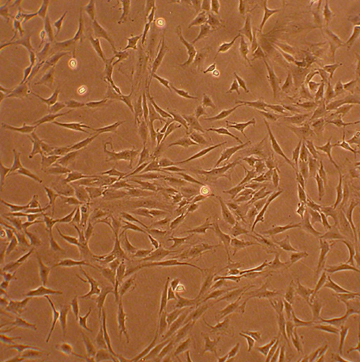 Human Chondrocytes-Osteoarthritis: HC-OA, Cartilage producing cells isolated from the joints of diseased tissue donors. Dua, R., K. Comella, R. Butler, G. Castellanos, B. Brazille, A. Claude, A. Agarwal, J. Liao and S. Ramaswamy. 2016. Integration of Stem Cell to Chondrocyte-Derived Cartilage Matrix in Healthy and Osteoarthritic States in the Presence of Hydroxyapatite Nanoparticles. PLoS ONE, 11(2): e0149121. Samavedi, S., P. Diaz-Rodriguez, J. Erndt-Marino and M. Hahn. Tissue Eng Part A. 2016. A 3D chondrocyte-macrophage co-culture system to probe inflammation in experimental osteoarthritis. Tissue Engineering, Part A, doi:10.1089/ten.TEA.2016.0007.